I recently was giving a friend a gift that was too difficult to wrap, so obviously I needed a gift bag. I save any bags I receive to reuse, but none fit the occasion. I was shocked at the prices at Target. Yes, I could have gone to the Dollar Store but there wasn't one near me. I gave in and bought the $4.99 bag and the $3.99 tissue and moved on. While thinking about the holidays coming up I realized there has to be a better way to give things that belong in a gift bag, so I took a trip to visit my best friend, Joanns. I found a great little draw string bag, $4.99 but 40% off so $3, already cheaper then the gift bag I purchased. I searched for some cute Christmas fabric for E, found it for $9.99 a yard, again it was 40% off so $5.99 and I didn't even use 1/4 of it. I grabbed some Heat and Bond, I really need a sewing machine, and was on my way. 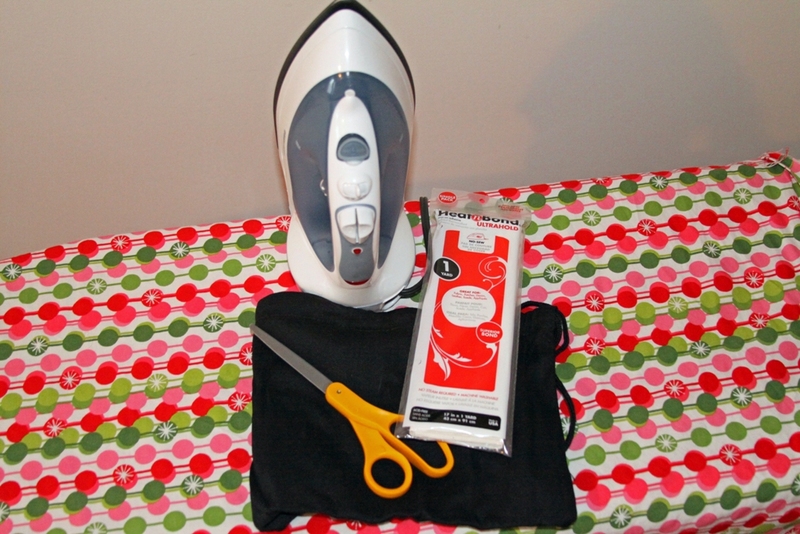 Start out with washing your fabric, you don't want it to fray or shrink in the future. Iron out your fabric and cut it to the size you would like. I needed a pretty good shape for my Cricut so I used a frame to cut a rectangle, I can't cut straight to save my life. 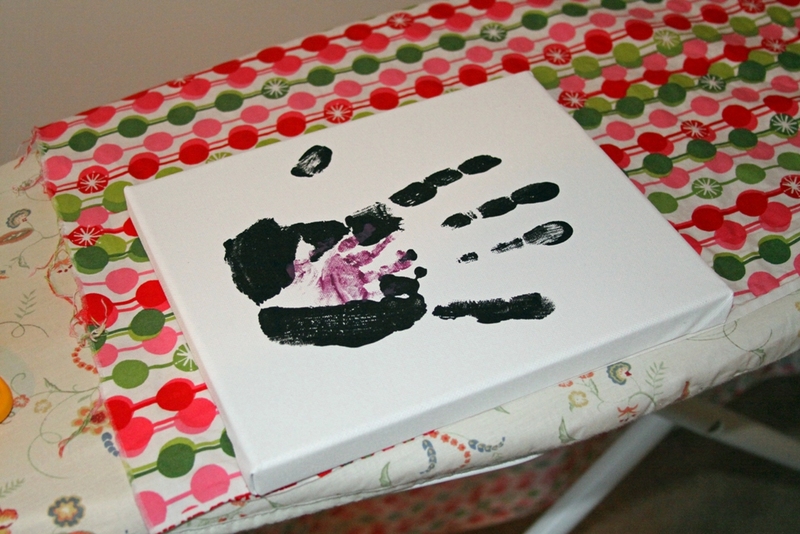 This is a canvas of Mark's hand(black) with Eliza's hand(purple) in the middle...she wasn't too cooperative, we will try again one day. Now take the fabric and trace it on the Heat and Bond to get the same size square. 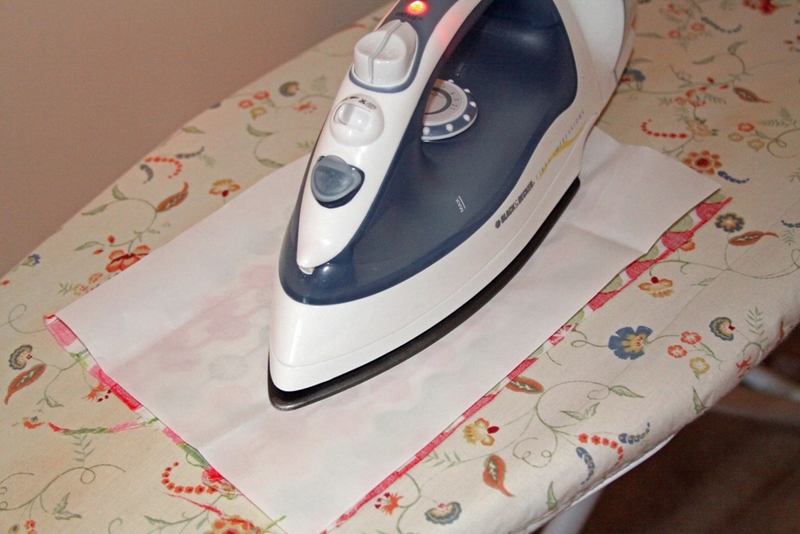 Iron the Heat and Bond onto the fabric, paper side up. Make sure it is really sticking to your fabric and is completely smooth. Cut out the shape, word, or letter that you want. I used my Cricut to cut this, once again I am not good at cutting so this was the best solution for it to look good. 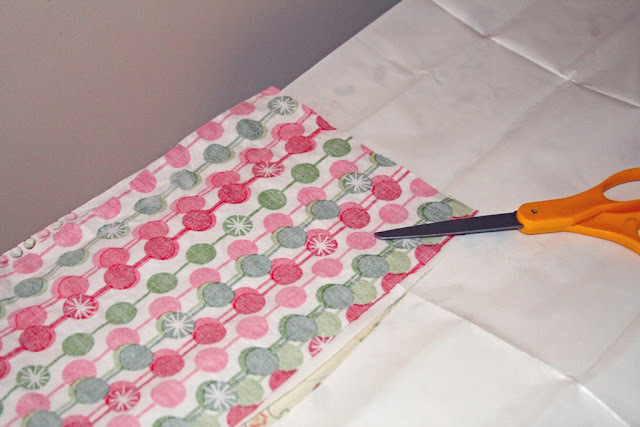 Once you have your shape, remove the backing paper and lay it onto your bag. Iron it on following the directions of the Heat and Bond. You are all set! For roughly about $5, after my 25% off total purchase coupon they text to you 3 times per month, I have a gift bag, and a gift! Perfect for the holidays!! 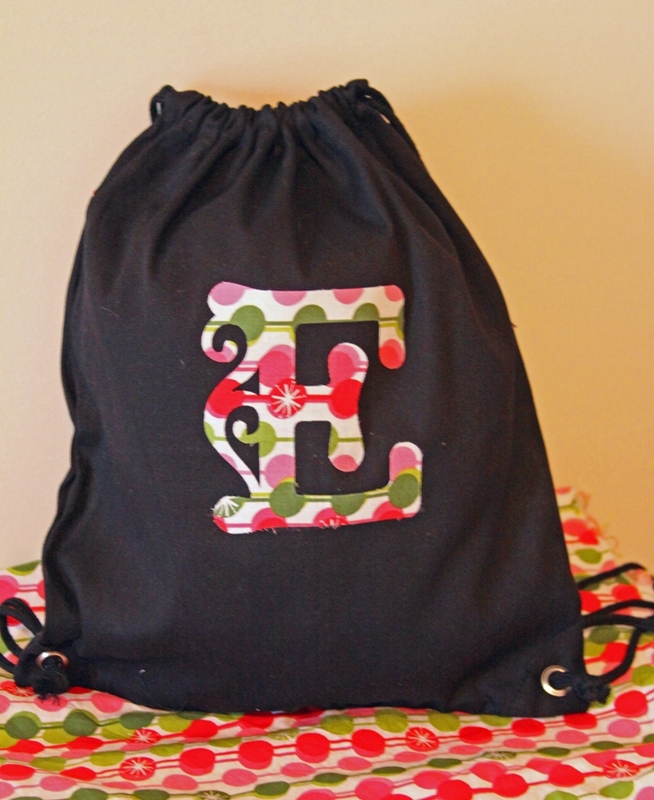 No need to wrap your gift, just slide it in the bag! @Katie Thanks for checking it out! It would be a great way to give someone a gift card too. I am using mine as our library book bag right now. This is so much nicer than the Target bags! It will be useful beyond the usual regifting purposes of paper gift bags. And it really looks so attractive! I love it and these would be great as favors for a sleep-over party! @Pati @ A Crafty Escape that is a great idea Pati, I hadn't thought of that! Thank you! First off, you're daughter is so adorable! This is such a great idea! It's like a gift in a gift! So cute. I love this idea! I LOVE the fancy E! Thanks for linking up to Sassy Sites FFA party on Friday!! I LOVE to see all of the great ideas! All week this week, we will be doing Thanksgiving themed link ups. Monday is Turkeys, so if you have something you've created that is turkey-ish :)... come by tomorrow and link it up! !